When community members, elected and business leaders strategize what to do with the 10-years-dormant Frontier House, the conversations tend to suggest the 191-year-old building is dilapidated, falling apart and structurally suspect. Broker Bruce Andrews doesn't use those words. Instead, he calls the Center Street landmark amazing and uses descriptions like character, craftsmanship and skill. "You have to realize that this has a lot of value for Lewiston," he said. "This is Lewiston. So it has to be brought back. ... You have to bring this back to something like it was." Nearly 200-year-old trees frame the Frontier House. Right before Memorial Day weekend, the Frontier House and almost one acre of land was listed with Andrews and Great Lakes Real Estate. The asking price: $1,695,000 - almost $1 million more than the GAR Associates appraisal submitted to Town of Lewiston Supervisor Dennis Brochey last month. On Thursday, Andrews provided this writer with an in-depth tour of the Frontier House - the well-known street level, the basement, three upper floors and each and every room. In explaining his valuation, he meticulously detailed the work involved in developing the former hotel in 1824. Andrews showcased the building's nearly 200-year-old post beams, which were crafted from hand-cut trees and are prominently displayed on the upper levels and inside the roof; the original woodwork, stone walls and decorative trim on floors two and three; and even the marble that exists beneath a layer of dust on the main second-floor fireplace. Andrews spoke of tales of secret Freemason meetings. 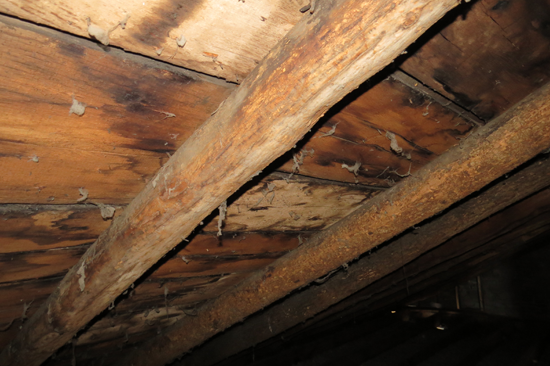 He pointed out the cut nails and hatchet marks still visible after two centuries, and the ladder allegedly used to climb onto the roof and scout out incoming stagecoaches in the horse-and-buggy days. "You had 18 guys cutting stone for a year for this building," he said. "That's all they did; they just cut stone so they could put the stone up. You just can't find that kind of thing (today)." "You can still see the grain in the wood," he added. "There's some serious history here." "The bark is still on the tree," Andrews said as he patted his hands on the roof's limbs. "How do you appraise a value on a building that was made by men who cut trees down and used them for rafters? That's the incredible history of this building. ... How do you put a value on that?" "I think it's invaluable," he said. "And I think it has to be cleaned up and brought back to the original grandeur that it had." "1824," Andrews said. "These trees were cut down in 1824. It's amazing, isn't it? When you do an appraisal on a building like this, they're just looking at the building, the structure, trying to find (comparables); seeing what other things have sold. That's the standard procedure." In an email to the Sentinel last week, Frontier House business development manager Stacey Sheehan, speaking on behalf of owner Richard Hastings and Hastings Hospitality, once again expressed dissatisfaction with GAR's $750,000 appraisal. "Even before we consulted others for expert opinions, we knew that appraisal was impractical," Sheehan said. "If you want to measure a landmark property, you should use a suitable measuring stick. (GAR's) appraisal type, applied to this property, was as good as using a thermometer to measure how loud something is. Value should have been established by comparing the Frontier House to other historic landmark properties across America, not by comparing it to a mini-plaza or car wash in the Village of Lewiston. "Where I acknowledge it is a difficult task to establish value on a property like this, I think the scope of this GAR evaluation really fell short. "Bruce Andrews, a local agent at Great Lakes, has assisted in establishing a more realistic sales price. On his recommendation, it's been listed at its current price, which Mr. Andrews believes is a fair reflection of the value in a one-of-a-kind, unique, nationally recognized property." In late March, Brochey asked the Town Board for consent to hire an appraiser to assess the Frontier House, which formerly housed a McDonald's Restaurant. If the price was right, he would recommend using Greenway funding to purchase the building from Hastings. Brochey would then pursue grant money to refurbish the Frontier House and reopen it to the public. GAR was hired and, about one month later, Brochey received the appraisal report, of which he said, "(The Frontier House) is probably worth more than the assessed value. How much more I couldn't say." The Frontier House was not discussed at subsequent Town Board meetings, and Brochey has not spoken with Hastings since receiving the assessment. Last week, the supervisor said the issue is all but dead now, as the appraisal number and listing figure are too far apart. He added, however, "If (the Hastings family is) interested, I'll sit and chat. If they're not interested, I'm not going to push it. ... My door's always open." Brochey said the town was in the best position to find repair grants. He was not optimistic a private buyer would emerge. If one does, "An individual coming in and buying it - even for the assessed value ... is going to have to look at possibly putting a million into it or more to restore it," Brochey said. Andrews said such an investment isn't uncommon when dealing with a historical building. He added, "The building is solid. It's sound." "The structure is still here and it's still solid," he said, and suggested interior cleanup (picking up trash, plastering, laying floorboards) could be done in a relatively short period of time. Andrews said the Frontier House's price shouldn't be measured against recent transactions, namely the purchase of Apple Granny, the restaurant that sits across the street, or with the Ontario House in Youngstown, which is reportedly in the process of being sold. "I looked at all this. And I said, 'You know what? You can't compare this to Apple Granny or another commercial building that sold for $300,000. You've got to take this (analysis) into consideration. This is just - you're selling history here,' " Andrews said. History, and a large parking lot and a unique view of the village no other building can offer. Andrews noted the asking price is just that, an asking price, and said the Hastings family will consider all reasonable offers. He has created a website, www.lewistonfrontierhouse.com, which provides additional details on the building. 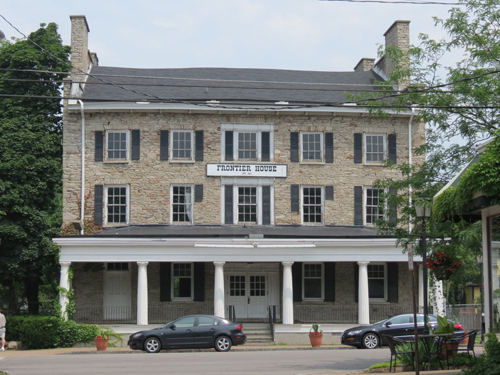 The Frontier House is located at 460 Center St.
GAR Associates Inc. has delivered its assessment of the historic Frontier House to Town of Lewiston Supervisor Dennis Brochey. The 191-year-old building and almost one acre of land were valued at $750,000. That number is lower than what Frontier House owner Richard Hastings and his son, Alan, expected. Both of them declined comment. Their business consultant, Stacey Sheehan, released a statement to the Sentinel that expressed the family's disappointment in the assessment. "We have had such a range of opinions on what the value is; we have consulted a number of appraisers and real estate professionals, and the valuations received go from $999,000 to $1.8 million," she said. "The Hastings - like any normal businessmen would - are taking those recommendations into account and are following the professional guidance they are getting from these sources. "It's not an office building, or a mini-plaza. It is on the National Registry of Historic Places. It's a place where President McKinley spent his last days alive. It's a place where Freemasons held secret meetings. Mark Twain was among the long list of honored guests and temporary residents of the Frontier House. ... It's a piece of American history." Last month, Brochey suggested the Town of Lewiston use Greenway money to purchase the Frontier House, which he called Center Street's crown jewel, and then apply for grants to fix it up. The Town Board agreed to pay GAR $2,200 to evaluate the property and determine a net worth. Of the appraisal, Brochey admitted, "(The Frontier House) is probably worth more than the assessed value. How much more I couldn't say." "The appraisal probably did not take into consideration the historical significance of it," he added. Sheehan said the report also neglected the property's physical attributes, which are unique to the village. "In addition to its history, it's a double lot, and the last place on Center Street with ample parking," she said. "What is that worth? That's the tough question." The Frontier House has been vacant since McDonald's left in late 2004. Though Richard Hastings has put time and money into fixing the building's roof and stabilizing the structure so it doesn't collapse, the building has been deteriorating. The outside needs a complete renovation. Inside, there are no stairs connecting the ground level with the second floor, and the upper three levels are in desperate need of patchwork. GAR Associates Vice President Ronald J. Rubino walked through the Frontier House earlier this month. At the time, he said the building would be evaluated on its history, age, size and condition. "In this case, we'd be focusing more in the Village of Lewiston, since it's a very definable neighborhood," Rubino said. "We try to find what real estate values are for similar properties. "Obviously, a unique property like this, it's unusual to find ones that maybe have sold that are similar to it. So, it makes it a little more challenging. Coupled with ... the condition that it's in - it's also larger with regard to land area and it has significant parking that's superior to a lot of properties in the village. That makes it unique. And the building, square-footage-wise, the sheer size of the building is larger than most buildings in the village. And that makes it unique, as well." Rubino declined comment Wednesday, citing assessor-client confidentiality. GAR is an Amherst real estate appraising and consulting firm. Sheehan said it appeared GAR focused solely on real estate comparables. "That's the trouble with these appraisals," she said. 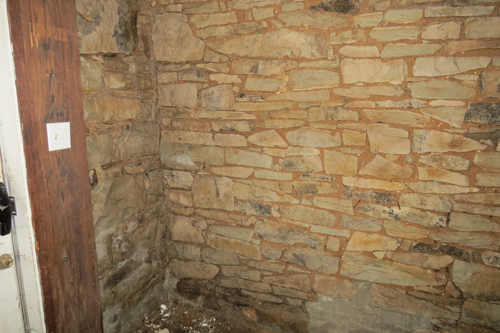 "They are just not an accurate measuring tool when it comes to value on historical properties. Sure, they take into account comparables by looking at other Lewiston properties that have sold recently. They compare the Frontier House to, say, Apple Granny (which recently sold for more than $1 million), and the Collins Childcare Center building (and) a mini-plaza. It's like comparing apples to oranges. They look at things like square footage, location, zoning, which are all acceptable in a normal real estate transaction, but this is no normal real estate transaction. "The dollar value that the board requested (and) appraisal returned is lower than it should be, because it's not designed to reflect the value of a historical property. It's not the appropriate measuring tool - the math just doesn't apply to landmark properties." Sheehan said she hoped politics didn't play a part in the appraisal process. "It's my understanding that there are some people on the Town Board who understand (the value), and others who don't. There is a divide," she said. 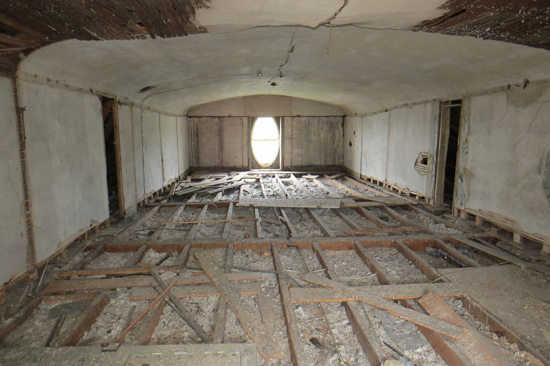 "Despite the fact that no taxpayer funds would be tapped to do this project, I've heard from residents who say that the town should not participate in restoring this building, because it is actually located in the village. I think that's backwards thinking." "It's not Village of Lewiston-specific," she added. "It's not a Democratic concern, or a Republican issue. Restoring the building is of national benefit. (People) in general - for generations to come - would have benefitted from this acquisition. It would have been a source of pride for all of Lewiston, and for Niagara County, New York state and America." Brochey said the Town Board members have not seen the appraisal, because he has not yet seen them. He expects to share the findings ahead of Monday's Town Board meeting. With regard to purchasing the Frontier House, Brochey said, "A couple people are still thinking that Greenway money was tax money - my plan was to use Greenway money to purchase the Frontier House - and that is not tax money. That is New York Power Authority money." In 2007, NYPA earmarked $450 million for Greenway projects to be funded over the course of its 50-year relicensing agreement. The Town of Lewiston receives $510,000 each year, which can be used on projects in keeping with the Greenway Plan's mission to build and promote a series of "interconnected parks, river access points and waterfront trails along the Niagara River from Lake Erie to Lake Ontario at the site of Fort Niagara." 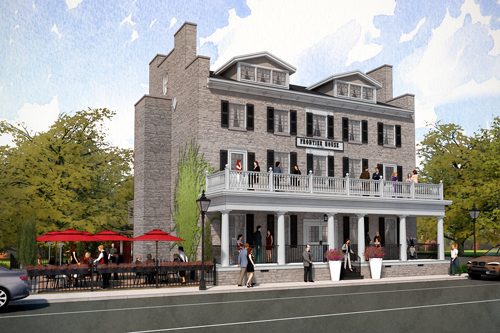 In 2013, Alan Hastings announced his intention to convert the Frontier House into a brewpub. Since then, he has looked for funding sources, but to no avail. Various Village of Lewiston officials have speculated it will take between $1 million and $10 million to fix and then reopen the Frontier House. "I have spent two years looking for grants to assist the Hastings family with development, and it's disheartening," Sheehan said. "They know how much people want to see the Frontier House up and running, and preferably in a retail capacity, but all of the grants we've explored are off-limits to projects containing retail." Brochey said, "I'd like to think that we're still negotiating" with Richard Hastings, but he's not going to push the issue. "If Mr. Hastings wants to come and talk to me ... I'd be more than willing to sit with him any given time of day," Brochey said. "But that's got to be his call. I know how he feels. I know he's upset about the appraisal. There's not much I can do. I can't force the people of Lewiston, or force the board, to pay what Hastings wants for the building. But, hopefully, somehow, we can come to terms." Sheehan said, "I know that the Hastings really appreciate the town looking for ways to work on this, especially Supervisor Brochey, who has really displayed his patriotism and leadership in this, and other town matters. They are also thankful for the encouragement we've received from the current Village Board, as well. "As for what happens next? The Frontier House is still for sale and will be listed with a local agency this week." The Frontier House doors opened Thursday to a pair of assessors from GAR Associates Inc. The two men spent about 30 minutes inside the building. They went floor by floor, touring each room, taking pictures and asking several questions. The Lewiston Town Board tasked the Amherst real estate appraising and consulting firm with placing a monetary value on Center Street's historic landmark. Supervisor Dennis Brochey recently announced Frontier House owner Richard Hastings is considering selling the building and grounds to the town. GAR Associates Vice President Ronald J. Rubino said the building will be evaluated on its history, age, size and condition. "In this case, we'd be focusing more in the Village of Lewiston, since it's a very definable neighborhood," he said. "We try to find what real estate values are for similar properties. The Frontier House has been vacant since late 2004, when tenant McDonald's opted out of its lease. The surrounding lot is currently used for municipal parking. Both Town Board members and Village of Lewiston trustees have said the building is in desperate need of renovation. Two years ago, Hastings' son, Alan, proposed converting the Frontier House into a microbrewery, but was unable to find funding to fix the 191-year-old structure. Rubino said it's tricky contrasting the building's potential with its current state. "You have look at the neighborhood and the demand," he said. "You have a lot of visitors that come here. The potential here is - and the challenge would be - is there a year-round market or more of a seasonal market? Are you getting the Canadian influence; people coming up from Buffalo? If it's going to be an operator, can he have enough sales volume for some kind of restaurant or bar or club or brewery, or rooms upstairs? So, it's a challenge to find the right combination of the real estate and the renovations to match what the market's going to bear. "That would be the challenge of who would be the end user or users for it. It's one thing to renovate it; you know, bring it back up to its original character, which would be a tremendous challenge. But then to find a user that can take the layout - it's a unique layout - it's a challenge to find. There used to be a McDonald's here; they had fine dining restaurant and rooms upstairs. What will the market bear today? That's going to be a challenge and may take a marketing effort to find the right match for a building like this. "At this point, I don't think there's an answer, because it could go many different directions as we stand here." GAR is expected to produce an assessment in the next few weeks. Rubino said, "With any report, there's always a highest and best use, and our opinions as to what it could be used for - as if it were vacant and as if it were improved - in the condition that it's in today, and what it could be if it were renovated and restored." If the Town Board receives a valuation it considers fair, and Hastings is satisfied with the price, Brochey said the next step would be to apply for Greenway money to purchase the Frontier House. Greenway Commission Vice Chairman and former Village of Lewiston Mayor Richard Soluri recently announced his support of a town acquisition. Brochey said his board would bond the fee and allocate up to $200,000 of the town's annual $510,000 Greenway allotment toward paying it off. He said no taxpayer money would be required. Since announcing his plan March 23, Brochey said the public response has been overwhelmingly positive. "I'm going to say, maybe two negatives - three negatives at the most, I've heard. Everybody else has just been positive that something's got to be done. It's on the National Register. There's a lot of history," he said. "I talked to one guy the other day that they had his wedding reception there over 50 years ago. There's sentimental value to local people, too. It's not just the historical significance." Brochey recognized the time and effort it would take to fix and reopen the Frontier House. He said the end result would justify the means. "I love the building," Brochey said. "I ate there back in the late '60s when it was a beautiful restaurant. My daughter worked there when it was McDonald's. I guess I've got sentimental value to it myself - much like the people of Lewiston do. "Being one of the oldest buildings probably in Western New York, outside of Fort Niagara, there's so much history there. I don't want to be like Niagara Falls that tore down everything and they can't bring it back to life again. This can only improve the Center Street ambiance. It just fits right in with everything else." Brochey also had an opportunity to tour the Frontier House. "It was different from what I remember it," he said. "I ate there in the late '60s and I can see the beauty coming back. I can see where this could be something everybody will be proud of once it's completed. But I can also see this is going to take several years before it's completed. "I'd love to see it done by the year 2024 - at the 200th anniversary - completely done." That said, "I think you're going to see a big difference - if everything falls in place with the Greenway money; with an agreement with the Hastings - I think people are going to see a big difference just in a year from now. That's what I'm looking for," Brochey added. He said the Town of Lewiston is in better position than Hastings to find grants to fix the Frontier House. If the building is purchased, the supervisor intends to form a committee to establish its use and/or find occupants. If the Town of Lewiston is successful in purchasing the Frontier House, what would happen next? What would go inside Center Street's centerpiece? "I plan on forming a committee, and it's going to have engineers, historians, local business people ... people from the Village Board - the trustees, the mayor himself," Supervisor Dennis Brochey said. "We have to put our heads together and work on this together - on what's the most viable use for this. We have to come up with a way that, once it's all set and done, we don't want a burden on the taxpayers. "We want to make sure that there's some sort of income coming from it. Although that's going to be limited, because we can't use it for retail whatsoever. But it's my understanding that we could possibly do offices up there, as long as people don't go there as a retail type of thing." Town Board members unanimously voted Monday to spend $2,200 with GAR Associates Inc. of Amherst for an appraisal of the nearly 200-year-old building and its surrounding property. Frontier House owner Richard Hastings has had several conversations with Brochey regarding a possible sale. "It's one step at a time," Brochey said. "The first step is to get the appraisal. The appraisal could be not what we want. It could be too cheap for the Hastings. It could be too much - well, I don't think it can be too much; I don't think you can put a price tag on it. Because it's one of the oldest buildings in Western New York. "It's definitely an eyesore right now, but, gosh, I can see the beauty in it later on. But the main thing now is to get the appraisal - (to) work out an agreement with the Hastings on a good price that's going to make the people of Lewiston happy, and the Hastings (too)." Brochey likened the Frontier House to Boldt Castle in the 1,000 Islands. The Alexandria Bay building was erected in 1900 as a tribute to Waldorf Astoria proprietor George C. Boldt's wife, Louise. Construction continued until 1904 when Louise unexpectedly passed. George didn't have the stomach to carry on with the castle, and so it sat vacant for 73 years. Today, "They have boat rides going out there, and they charge admission," Brochey said. "They're slowly going one room at a time restoring this big, huge castle. It's beautiful. I've been there two or three times and, each time I go there, there's something new being done - and the money (is) coming in. "Is it possible that we could charge admissions and stuff like that to get people to help pay for the (Frontier House) restoration? We've got to look into everything. You can't leave any stone unturned. "I'm kind of excited about it." Stacey Sheehan, business development consultant and project manager for The Frontier House acquisition, said, "I know how Supervisor Brochey feels about this, and both the Hastings family and I have a tremendous respect for him. He has vision, courage and maturity, and it's evidenced by the way he is ready to extend his responsibility not only to those he represents now, but beyond into the future by looking ahead to how Lewiston residents and visitors to our area will benefit from this acquisition for decades to come. He identifies that the Frontier House is a lot more than a piece of real estate or an old stone building. It's a priceless part of who we are - a piece of the body of Lewiston. I hope the board shares this sentiment (and) will support his efforts, and that the purchase will go smoothly." Brochey said the Hastings family has been "wonderful" to work with, and said he's never had a problem with Richard. "We would just talk back and forth like that," Brochey said. "And then, every once in a while - not every time - but every once in a while, somehow, the Frontier House would be brought in. I said, 'You know, we ought to chat about that some day.' And he would come up with his idea: 'You know what, Dennis, I would love to see that restored - just the way it used to be 200 years ago.' I said, 'Oh, that's the same thought I had in mind, too.' "
Brochey said the Town of Lewiston would rely on Greenway money to purchase the Frontier House. The Greenway Commission's mission is "To continue and advance the state's commitment to the preservation, enhancement and development of the world-renowned scenic, natural, historic, cultural and recreational resources of the Niagara River ... while continuing to emphasize economic development activities." Richard Soluri is vice chairman of the Greenway Commission. He served as mayor of the Village of Lewiston for 15 years, and is all too familiar with the Frontier House. "I'm pleased with (the Town Board's) first step to secure an appraisal," he said. "And I hope all parties cooperate fully." As a Greenway commissioner, "I would just like to see that building open," Soluri said. "We have a very good downtown; a very good Center Street. But this would make it the focal point of a good downtown right now," he added. "You need to retain the historic uniqueness of it. I'm not certain, depending on what grants are received and where the ownership goes, but one thing I would like to see them do is sell all New York state products. And it's a natural to be part of the Niagara Wine Trail. The governor's helped out craft breweries, and that was Alan (Hastings') original idea. "The farm produce that we have in our area is unique. The festivals. We have the history. Between the arts society, historic society and all the uniqueness of those organizations - including Peach (Festival), which honors the fruit-growing region; Jazz (Festival), which ties in totally with Artpark - I think the building would have to have multi uses." Brochey said, "We have to come up with a cure for the overhead. Because once it's all said and done, it's going to have electricity, gas, water. So we've got to make sure that it doesn't cost anybody anything. It would be a true jewel for everybody then." Soluri said the Greenway Commission has not discussed the Frontier House in his seven months of service, but he noted, "We are one of the very most historic communities on the Greenway." "The river is an integral part," he said. "We've honored the Underground Railroad there. We've had different projects such as The Silo, the Whirlpool Jet Boat. ... I don't think there's any question that it could be a Greenway project. The more we can tie it to the river - to the Greenway - the better. "It probably needs some type of exhibit that leans towards fishing and boating, etc. And we have a history of boating from many years ago. The reason it was called Lewiston Landing way back when ... was because of the ships that used to come in and out of Lewiston." Soluri added, "Economic development is an important part of the Greenway charge - the Greenway mission. It would be an economic development project, and it could be a waterborne project. "I'm all for it. I hope it works." Moreover, Soluri has volunteered to serve on Brochey's committee. Sheehan said, "The town has access to specific funds that the Hastings family can't reach as private businessmen - various grants, Greenway funds, bonds. It is a good fit, because Lewiston has the reach - the funding and the manpower at their fingertips - and can do this with little or no taxpayer money coming into play. They are the perfect buyer for this historic property." The Town of Lewiston took its first step Monday toward a possible acquisition of the Frontier House. The historic Center Street property has been vacant since December 2004 as its owner, Richard Hastings, and his son, Alan, have been unable to find funding sources to restore the 191-year-old building and transform it into a restaurant or retail business. "Off and on, Richard Hastings and I would talk about his plans for the Frontier House and how he would like it to be restored to its glamour. Over the last several months, Richard has said to me that he's getting tired and wanting to spend more time with his grandchildren, but he never stopped talking about his vision of the Frontier House. "Recently, I mentioned to him a few ideas that I had that may encourage him in selling the Frontier House to the Town of Lewiston, and how we could fund it without taxpayer money. We met eye to eye on restoring it for the future generations and to have it become a national destination." Brochey wasn't shy in praising the Hastings family for taking this course of action. He said a restored Frontier House would benefit Lewiston. "Richard Hastings and I believe this Town Board shares that dream, and I'm sure many other Lewistonians local and afar feel the same way. (The Hastings) made a decision to possibly place the Frontier House's future into the hands of the people of Lewiston, which only solidifies their sterling reputation and their place in Lewiston history," the supervisor read. "The Frontier House is our touchstone to the past that makes Lewiston the envy of other communities. It's not only a cultural icon, but it will become a key in unlocking Lewiston's economic development and potential. The Frontier House could become a fully functional and working building that will breathe new life and excitement into the Center Street business district. "Today, I hope we join hands with the Hastings family to take Lewiston to the next level, allowing everyone in our community to become a stakeholder in one of the most inspiring projects we've ever undertaken. We owe the Hastings a debt of gratitude for their steadfast determination, and their encouragement, to let the people of Lewiston set the course for the Frontier House's future development. "There will be many steps to be taken before this is to happen. The first (is) to get an appraisal of this Lewiston staple that many tourists have seen and wondered what it may have been like in 1824. Once that is done, we, the Town Board, will sit with the Hastings and negotiate a fair price for them and the people of Lewiston. Nothing further will happen until this is done." Brochey asked the Town Board for permission to seek an appraisal. "I'd like to concur with the supervisor in the sense that I think the Frontier House is one of those marquee buildings in the Town of Lewiston that really sets the town apart from any other community in the area," Councilman Alfonso M. Bax said. "I think that the community at large has been looking for a way to utilize that facility. Both the Hastings family and other interested organizations have expressed interest. ... We've had a difficult time coming to an agreement on everything. "But I agree, again, with the supervisor to say that the town becoming involved - leveraging our Greenway money - may be an opportunity for everybody in the town. So, I think the first step is warranted, to get an appraisal (and) figure out where we stand." Brochey received three price quotes from appraisal companies. The Town Board agreed to spend $2,200 (the low bid) to have GAR Associates of Amherst evaluate the Frontier House building and property. That first-level assessment should be completed in about a month. "Let it be known that it is the quest of this board not to use taxpayers' money on this project, but to look for the assistance of the Greenway Commission, grants and donations to accomplish most of this," Brochey read. "I will help form a committee ahead of time to figure out ways to also have it self-sufficient and paying its own overhead costs. Even after the hopeful purchase of this diamond in the rough, it'll be several years until we see its completion." Upon approving Brochey's request, the board received applause from the crowd of about 20 Village of Lewiston residents on hand to support the supervisor's plan. Those in attendance included the Village Board of Trustees and members of the Historical Association of Lewiston and Lewiston Council on the Arts. "(We're here) to encourage this board ... to pursue what you are doing now," Village of Lewiston Mayor Terry Collesano said. "We're very happy that you're taking the lead in this." He, too, read a prepared statement. It said, in part, "The Village Board and I are very excited about the possible restoration of the Frontier House - bringing it back to a fully functional and valued property. This would be one of the best investments Lewiston can make. "The potential impact Lewiston would receive by bringing life back into this historical jewel will spell a dramatic difference in our local commercial downtown, creating also a new historical designation." There are no firm plans for what will happen if and when the town buys the Frontier House, or what would be located inside the building. Brochey said the committee would look into uses, as well as identifying whether the town would permanently retain ownership. If the town comes to an agreement with Hastings, Brochey said the board would bond the money and use Greenway funds to make yearly payments. The municipality receives $510,000 each year. Brochey said he wouldn't want to spend more than $200,000 per year on this endeavor. In recent years, elected leaders have speculated Hastings was looking for $750,000 to $1 million for the building and property. Village of Lewiston Mayor Terry Collesano's Frontier House citizens committee met this week and is working on a plan to save the historic Center Street building. He called the private meeting "informative," and said, "I think we're making some progress." "The committee is coming up with some very good ideas," Collesano said. One of those ideas is acquiring the Frontier House, which has been closed since former tenant McDonald's left in 2004. "They're trying to figure out a way of purchasing the Frontier House, and then come up with a plan," Collesano said. "And then the village, what we would do, is we'd represent the committee as being the lead agency. If it did come to being purchased, then the village would purchase it. But we don't want to be in real estate." The Village Board first floated the idea of buying the Frontier House last summer. Collesano and trustees said they would rather Frontier House President Alan Hastings secure funding to restore the 190-year-old building and convert it into a microbrewery (Hastings' idea), but public monies might not be available for a privately owned entity. "For the past six months, Alan Hastings has sought funding for the Frontier House microbrewery project," his business consultant, Stacey Sheehan, said. "Various means have been explored, including grants, tax credits, property sales, trades, private investors, business partnerships and high-level meetings at local, state and federal levels. "To date, he has been unable to secure the staggering level of funds required to break ground. He is aware the value of the building lies in its rich history, and has a comprehensive understanding that the community is looking to him to see that it gets developed." Collesano said, "My board, I've told them that we don't want to be in real estate. But if it takes us to be the lead agency in order to purchase it, in order to get the grants and what have you, we would do that. But then we would turn it over to the committee." Whether the building would then be used as a not-for-profit center, cultural hub or retail/restaurant space is unknown. "It's still in the early stages," Collesano said. The citizen committee is chaired by former Niagara County Legislator Lee Simonson and includes members of the Historical Association of Lewiston (including Simonson, Pam Hauth, Leandra Collesano and Lisa Ohanessian), businesswoman Margaret Toohey, the Lewiston Council on the Arts' Eva Nicklas, former Village of Lewiston Planning Board Chairman Ken Slaugenhoupt and, in advisory roles, Collesano and Town of Lewiston Supervisor Dennis Brochey. "There are ongoing discussions and conversations regarding the future of the Frontier House," Simonson said. "A lot of people think that this kind of fell off the table and we forgot about it. We never forgot about it. This is Lewiston's No. 1 priority. "There are a tremendous number of serious people who want to get this thing fully restored and operating, and we are doing everything we possibly can to make that happen." The biggest obstacle is funding. Those involved in the Frontier House discussion estimate the cost to restore and reopen the building would be north of $10 million. "We are working very hard to put all of the pieces together," Simonson said. "It's not easy. The fact is that because of the cost of the restoration, it is extremely difficult to make the numbers work in terms of making it economically viable for developers or for the owner." "There are ongoing discussions and we're working hard," he added. Hastings has asked the village for permission to subdivide the Frontier House lot at 460 Center St. He said he wants to keep all options open. Sheehan said he "is considering all possible paths to development." She revealed, "The concept of separating the side containing the structure, and the side containing the parking lot, is on the table. Of course, adequate parking for the new owner would still be included. He is considering selling the property to the right buyer. The right buyer would be someone with honorable intentions for the property. In order to lower the asking price, and encourage buyers who are in the position to develop the property immediately to come forward, he is considering subdividing the property. "Although he would prefer to keep the property and continue working towards the brewery concept, he identifies it could take a very long time to achieve the financing and funding necessary for him to go forward. "The dream for the microbrewery is very much still alive, but if the right buyer emerges with a plan that is a good fit for the Frontier House, he is indeed willing to sell it and pursue his own development in an alternate location - which, from my perspective, would be favorable, allowing him to do so at a fourth of the price, and in a much shorter timeframe. "If there is a party out there who has the means and dedication to restore the Frontier House, I hope he/she will emerge. He is looking to explore any way to take care of the historically impressive building, and also allow him the opportunity to see his microbrewery through to fruition." Hastings said, "I don't know where we're at, but we are prospecting hard." "There's definitely lots of hope," he added. "There's lots of hope." "I just don't know what's going to happen," Hastings said. "I really don't know what's going to happen. It would be foolish to make any predictions or any assumptions at this point. Everything we're working on right now is so new. "I haven't thrown out a brewery. There's still a very good chance that I could end up with a brewery in that Frontier House." Simonson said the committee is working as a "facilitator" between the village and the Hastings family. Alan's father, Richard, owns the Frontier House. "The committee is working directly with the Hastings to create a framework for negotiations (with the village) - a conceptual framework that we can build upon to move this thing forward," Simonson said. "We are volunteers. We have no self-interest here. Our interest as a committee is to see that Frontier House restored and operating, and bringing it back to its glory days," Simonson added. "That's our one and only goal. "We're doing our best to get everybody at the same table on the same page." Hastings said, "We're working hard - and I'm not the only one working on it, which is great. Which is wonderful. Very exciting to have other people working on it in a positive way, as opposed to a negative way. "I can tell you that I'm very excited about that. Very, very excited. No negativity. Just trying to find something that works for everybody. And I really feel like that seems to be the way things are going. So, I'm very hopeful." It certainly could be. That's Alan Hastings' plan. The Silo Restaurant proprietor has recently taken over the historic Frontier House. He reopened the parking lot and is working with the Village of Lewiston and local elected leaders to convert the building into a microbrewery, restaurant and inn. This drawing represents Hastings' plan for 460 Center St. In a pre-election interview with a daily newspaper, Village of Lewiston Mayor Terry Collesano was quoted as saying he was disappointed in what he termed "lack of movement" at the historic Frontier House on Center Street. Collesano said he "was becoming very discouraged" and had a "disappointing" meeting with Frontier House President Alan Hastings. He called for action by the end of June. Hastings told the Sentinel he didn't appreciate Collesano's comments, and wants to set the record straight on the Frontier House, which is owned by his father, Richard Hastings. "I have been spending my own money marketing Lewiston as a whole," said Hastings, who operates the successful Silo Restaurant on Water Street. Of the Frontier House, he said, "I'm trying to bring us a microbrewery, which would complete our hospitality offerings. I'm pounding the pavement trying to get financing for the Frontier House, to save it, preserve it, and make it something we can all be proud of." There's no debating the Frontier House needs repairs. Hastings said he's doled out considerable money in the past year to ensure the building doesn't further deteriorate. "I've spent $50,000 on this effort in the last nine months, $20,000 on the roof alone," he said. "I know this is bigger than I can handle alone. I've employed Stacey (Sheehan), who has been working steadily at this for a year. She has written grants, a business plan, historical tax credits, partnerships, successfully explored all of our possible paths, come up with creative solutions, but Mayor Collesano seems very disinterested. I've closed businesses, sold properties, shelved other endeavors. I'm trying here. It's fine if he doesn't want to assist; he isn't obligated. But what bothers me is his (comments), acting as though he has done something - anything - to move us forward on the project." Hastings said he offered to sell the Village of Lewiston the Frontier House parking lot. He has allowed the municipality to use it, and he said he offered it to Collesano at a reasonable price. "In no uncertain terms, he said they couldn't afford it," Hastings said. "Stacey and I met with him. We were surprised he wasn't more interested, given all the complaints about lack of Center Street parking." In the article, Collesano mentioned the village's efforts to find additional parking spaces. Hastings said the acquisition of the Frontier House parking lot would help in that endeavor while providing him with additional resources to fix the building. "He could have greatly relieved parking congestion, and with the proceeds I could have made a dent in restoring the building," Hastings said. "It was a perfect scenario. I guess maybe he doesn't really understand the parking concerns? I don't know. I'd like to see a mayor go talk to the businesses on issues like this, when designating spending and budget, and ask them, 'Would a centralized municipal parking lot be helpful to you? How would it affect your business? Should I make this a priority? Would you support this purchase knowing it would break ground on restoring The Frontier House?' "
Collesano suggested his comments were made a month before the article was published. "Things have transpired since then that changes a little bit," he said, though he didn't elaborate. He added, "I don't think there's a disagreement (with Hastings)." "I still would like something by the end of this month," Collesano said. He wouldn't say if that was a progress report or some additional building repairs. With regard to Hastings' offer to sell the Frontier House parking lot to the village, Collesano said, "No one's come back on that. That was just a brainstorming thing that was thrown out there." When asked if the Village Board would consider such an offer, the mayor said, "It's something we could look at, but I don't know if that's going to be in the picture with what could happen in the next couple days." Alan Hastings, pictured, president of the historic Frontier House, reached an agreement with the Village of Lewiston this week to re-open the Frontier House parking lot to municipal traffic. "From day one, I thought it was important to keep the parking open," Hastings said. "It's just the first step in going in the direction that we want to go." Hastings intends to convert the Frontier House into a brewpub and inn. The west end of the parking lot is now open. The east end, directly behind and to the right of the building (drive-thru side), will open in the near future, once some additional cleanup is completed. The Village of Lewiston Department of Public Works employees completed some patchwork Wednesday to ensure the lot could re-open to the public. Alan Hastings has made a name for himself on the Lewiston waterfront, working with his father, Richard, to transform a coal silo into one of the village's most popular restaurants. Now, he hopes to do the same with the long-dormant Frontier House. Alan, who runs The Silo Restaurant, was recently named president of the Frontier House, the historic building that sits in the middle of Center Street's business district. 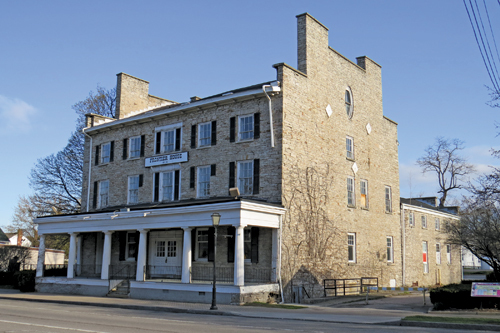 His father, through Hastings Niagara, gave him operational control of the building, which was erected in 1824 and served as a lodging spot for historical figures such as Gov. DeWitt Clinton, James Fenimore Cooper and Charles Dickens. As first reported last summer in the Sentinel, Hastings intends to put a microbrewery and restaurant in the Frontier House. "I really think this is the perfect fit for the Frontier House and for Lewiston," he said Wednesday. "I've got my parents on board. They've turned over control (and) decision-making of the Frontier House. My dad's going to be involved with the engineering ... but he is stepping back and really letting me take over." "Right now, the hurdle is going to be getting public support and some badly needed grant money and some financing," he said. That is, in part, because Hastings' idea does not include the condominium component his father and EI Team President Hormoz Mansouri previously proposed for the parking lot area. Moving forward with a microbrewery means the Frontier House would need those spaces. Hastings said, "I am working really hard" to offset the loss of potential revenue. "I know how important parking is - especially in the heart of Lewiston, and for this business. So, I'm trying to find a way to make it economical to keep the parking lot open and come up with the funds to develop the Frontier House into a brewpub." The elephant in the room, of course, is the fact McDonald's pulled out of the building in 2004 and, since then, the structure has deteriorated. 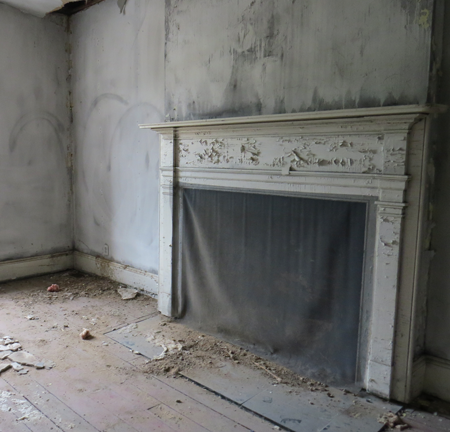 Each floor has cracked or exposed walls, missing paint and piles of dirt and dust. The exterior needs a complete revamp. Earlier this summer, the Village of Lewiston entered into discussions with Richard Hastings to obtain the Frontier House. This action, Mayor Terry Collesano said in July, was to put the municipality in a position where it could apply for state and federal grants to refurbish the building. Namely, the Village Board was applying for a $3.8 million grant from the state Department of Transportation. That sum breaks down to $750,000 to purchase the building, and the rest to restore it. Richard Hastings recently sent trustees a letter of intent to sell the property to the village. Should the Village Board be awarded and accept the DOT grant, and buy the Frontier House, it would be required to use the building for the public good (educational purposes). In other words, trustees could, for example, move the Lewiston Council on the Arts inside the building. That strategy has become "Plan B." On Monday, Collesano, speaking on behalf of the board, said trustees are in favor of Hastings' proposal to convert the Frontier House into a brewpub. "We are very happy with this idea, if its goes through," he said. "A microbrewery with private monies going in would eliminate the village of responsibility of buying the property and taking it off the tax rolls." "Private enterprise would be much better. ... The Village Board endorses this venture. We would endorse it whole-heartedly, because we want to see private money going into the village," he added. Collesano said the board is "cautiously optimistic." "Our main intent is to get some activity in that building, and to save that building, because everyone agrees it is the crown jewel of Lewiston," he said. "Opening a microbrewery has always been a dream of mine," Hastings said. "What a perfect location, and a perfect town, to do it in. It's really, really, an exciting project for me." Of course, if Hastings keeps the Frontier House, finding grant money will become more difficult. "That's the real challenge," he said. "It's definitely going to require everybody's support. You know, right now I'm just exploring different options. I haven't come up with a solution. I'm applying for grants." "I have been approached by several people who are interested in being silent partners and participating partners," he said. There is a "strong possibility" Hastings could work with the Village of Lewiston on a restoration plan. The way in which the DOT grant is structured, the village couldn't use the Frontier House for retail purposes unless it gave back an equal sum of grant money. So, if the grant is for $3 million, and 1/3 of the building is commercial, the village would have to repay $1 million. That is, unless the money is used solely for exterior repair. Trustees could leave inside work to a tenant. "I'm working sleepless nights on this, and I'm super-excited," he said. "I really think that we found something that works for everybody, and now we just have to find out how to put it together." "Quite frankly, it's time. It's time," Hastings said. "I feel like I'm the guy to do it. I'm ready to do it." Editor's note: The Hastings family is no longer pursuing this plan. This article is included so as to spotlight some more of the backstory behind this project, as well as early efforts by the Village of Lewiston to restore the building. News broke Sunday that the Village of Lewiston created a petition seeking support for restoration of the historic Frontier House. Throughout this week, residents visiting the mayor's office in the Red Brick Municipal Building have been encouraged to sign the document. To date, more than 500 have obliged. In doing so, they asked one question: What's going on with the Frontier House? "What we're trying to do, basically, is to purchase the property," Mayor Terry Collesano said Tuesday. Since May, the Village Board has met at least three times in executive session to discuss acquiring the Frontier House, which was built in 1824 and has sat vacant since 2004. Trustees have spoken with building owner Richard Hastings, attorney Maxwell Coykendall, and with Hormoz Mansouri, who is Hastings' partner on a planned adjoining condominium complex. Collesano said the village is hoping to obtain a Transportation Enhancement Program reimbursement grant from the state Department of Transportation. The village is looking for $3 million, which would include funding to complete the purchase and to renovate the property. "The $3 million would handle the restoration of the exterior of the building, as well as most of the interior of the building," Collesano said. "There's two other sources that we're going to go after, as well. There's the coastal zone management, which we are now in the process of doing the coastal zone management from the waterfront all the way up Center Street. That way we can include the Frontier House in it, and try for that grant. There's one other (source) that we're also going to go through, for immediate funds, through Greenway. We're going to try that one, as well." The U.S. Department of Commerce National Oceanic and Atmospheric Administration's coastal management program is described on the NOAA website as working to "preserve, protect, develop and, where possible, restore and enhance the nation's coastal zone resources." Greenway funding, meanwhile, comes through the New York Power Authority relicensing agreement. "The petition is for the (DOT) grant," Collesano said. "In order to receive the grants, it's imperative that we have signatures of support of the people." "What we're trying to do is, we're trying to roll the purchase price into the grant," he added. "In order to do that, there's certain criteria that we have to follow for the grant. We went to Buffalo yesterday, the state of New York's Department of Transportation, hoping that we could roll that into it. We can do it, but in order to do that, we have to wait for about a year. It takes about a year for procedure. We have to do a SEQRA; we have to write a letter of intent. We still believe that we can have everything done by the deadline for the grant, which is Aug. 15. That gives us a month to work on it. "We still need to have an open meeting, which we plan on doing on the 15th of July, for the public - we have to have public input on it." Collesano said the village, financially, could purchase the property right now. However, "we'd have to float a bond for it. And to do that, then we're holding ourself back." "If we have to buy it outright, then the village people are going to lose out on it," he added. "So, we're trying to do everything proper and, in order to do it proper, there's so many hoops that we've got to jump through and hurdles we've got to go over in order to do it properly. But that's what we're doing. We're going to pursue it." The DOT grant would require the village to give back 20 percent through in-kind funds - in this case, most likely "in-kind contributions of labor or materials that are an integral component of the project (DOT website)," and would come from the village's Department of Public Works. The grant will likely be awarded in the fall and dispersed next summer or fall. Mansouri, who is president of the Buffalo-based E.I. Team, said the Village Board and Clerk Anne Welch "are doing a tremendous work. They have been behind the project, to revitalize the Frontier House." "The opportunity has presented itself to own the Frontier House and promote it, and refurbish it and promote it to its glory days of the 1800s. I think that is tremendous progress for the Village of Lewiston," he added. In 2011, Hastings, Mansouri and former Frontier House partner John Bartolomei, a Niagara Falls attorney, proposed adding a multi-story condominium development above the property's parking lot. Last year, Hastings' son, Alan, who operates The Silo Restaurant, expressed interest in converting the Frontier House into a microbrewery similar to Buffalo's Pearl Street Grill & Brewery. On Tuesday, Mansouri said, "we have come up with an agreement in principle to go forward with the Frontier House, as well as the condominiums. So both of them are going forward." He said it's going to cost a lot of money to refurbish and reopen the Frontier House. At the same time, "Utilization of public funds for private use is prohibited," he said. So, "to secure the necessary funding for the village, it is essential for the village to have a right to decide (what goes into the Frontier House)." In other words, the Village of Lewiston would need a controlling interest in the property and have an idea of what it will be used for in the future. Mansouri said, "Yes, absolutely, we are working with the village on that route. We are working diligently with the village, and we want to support the village and village trustees and the mayor (in any way) to promote that idea." In return, Hastings and Mansouri would be granted permission to build condominiums. The most recent design showed a J-shaped complex sitting kitty-corner to the Frontier House and facing Ridge Street. It would be between three and five stories, with between 25 and 27 units. Targeted tenants would be baby boomers. Traffic would enter via Center Street and enter and exit on Ridge Street. There could be as many as 27 covered parking spaces, and an additional 37 parking spaces surrounding the development. "There have been some people in the village that they are opposing a massive building," Mansouri said. "We're trying to find a way to work with the village ... to ensure everybody's thoughts are incorporated into the new building, the condominiums. Under no circumstances do we want anybody to be offended by a big building, because we have that harmony built into (Lewiston), and a lot of people would like to hold on to it, and we want to accommodate them." Mansouri said there is "strong support" in the community for such a condominium development. "We also know the village trustees and the mayor, they have a strong position in terms of (ensuring) the public's thoughts are incorporated into the new project. For that reason, we are working to finalize the type of the building it will be, and the number of the condominium (units)." "We have to come up with a middle ground that everybody's happy," he said. "You don't want to offend anybody. Bottom line. Offending the public is not a good idea in any project." Leandra Collesano, vice president of the Historical Association of Lewiston (and Mayor Terry Collesano's daughter), was appointed to the Frontier House Restoration Committee. In a Facebook post, she wrote, "If you know me, you know about my passion for Lewiston and (its) rich heritage. ... Our first task is to see if there is community support in restoring the Frontier House at 460 Center Street in the Village. Once that support is confirmed through paper and online petitions, we'll have the ammunition we need to apply for grants to help with the restoration project. "Built in 1824, The (Frontier) House is one of the oldest structures in the Town of Lewiston. It's been listed on the National Register of Historic Places since 1974. A slew of famous people have visited the Frontier House, including President McKinley on the day he was shot, The Marquis de Lafayette, King Edward VII, New York Governor Dewitt Clinton, Charles Dickens, Jenny Lind, Washington Irving and Daniel Webster. The building has been vacant and in disrepair for almost 10 years." The online and paper petitions read, "We the undersigned support the Village of Lewiston in the restoration of the Historic Frontier House located at 460 Center Street, Lewiston NY. The restoration of this historic building will help preserve our history and heritage of our region. This great asset of The Niagara Frontier has served the world well, but it now needs help. Treasured properties should be passed on in good condition to future generations. The Frontier House deserves assistance." Leandra wrote about the Frontier House committee's unsuccessful effort last year to have the building included on the National Trust for Historic Preservation's "11 Most Endangered Historic Sites" list. She said the committee "is now gathering petition signatures to show there is community support to restore the Frontier House." Those wishing to sign the petition can do so in the mayor's office or by visiting http://www.ipetitions.com/petition/frontier-house/. Hastings declined comment Tuesday, only saying he has not made up his mind as to what he will do with the Frontier House. His building has been closed since McDonald's opted out in December 2004.